For some turntables, they may go 15 or 20 years without ever being looked at or serviced, resulting in a significant loss in musical performance from your beloved turntable. An LP12, like a car or a grand piano, needs to be serviced once in a while in order to keep it at its peak performance. 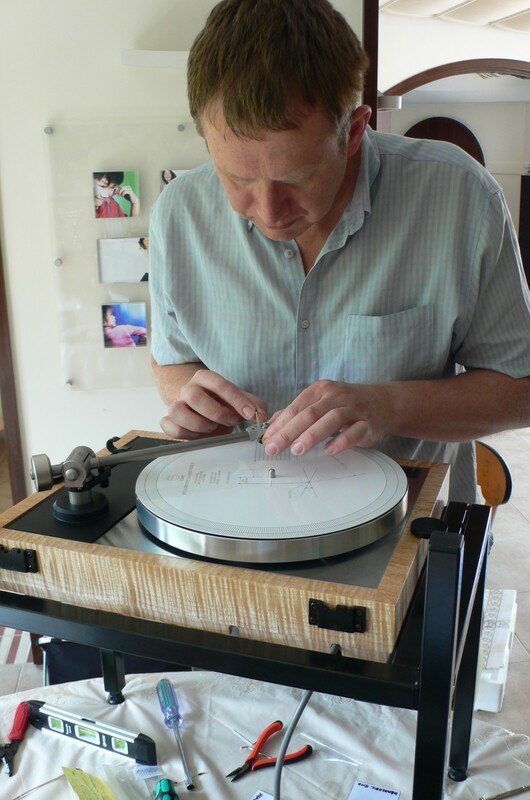 Peter Swain has more than 35 years experience of setting up and servicing turntables and can help bring your LP12 back to its very best. During that time we have made a speciality of – and are most well known for – the supply, upgrading, setting-up and repair of the Sondek LP12 turntable. All turntables regardless of their make can benefit greatly by correct set up and we are always happy to assist if we can. It was back in 1977 while working at a retailer called Listen Inn, that Peter Swain, the owner and founder of Cymbiosis, first found himself working on and setting up turntables such as Dual, Garrard, JBE, Logic, Systemdek, Thorens, Rega and others. Many of the skills learned in these early days were and are transferable and consequently, when a Linn account was acquired in the early 1980’s, Peter was able to apply what he’d learned from servicing and repairing other decks to some very useful Linn factory training. With this knowledge, now developed and refined over 30 years or so, Peter has established an enviable reputation for setting up turntables and the LP12 in particular. Today, this reputation for supplying and setting up the LP12 extends far and wide, and in addition to his regular contributions on the various Hi-Fi forums, he has written the LP12 Set Up Guide, an instructional guide and a “sticky” thread on the Linn Forum. The LP12 Set Up Guide is primarily written for those users who, because of their location, do not have access to a local dealer. Peter has also travelled to many countries across several continents in order to satisfy an ever increasing demand from customers for the best possible set up and sound from their turntables. Additionally, Peter has worked in collaboration with several Hi-Fi manufacturers over the years, on a number of projects, offering many suggestions and ideas as well as testing and providing feedback on some of the well-regarded products that you may be familiar with. These include Linn’s Aro Keel, Ekos Se, Urika, the Solid Baseboard for the LP12, Naim’s Airplug loading plugs for the Superline to name but a few. Peter has also had a great influence in the recent Tiger Paw Scale counterweights and new Elevator, the lift/lower device for the Naim Aro tonearm. There are many myths about the set-up of the LP12 with one of the most persistent being that they can easily go “out of tune”. The truth is that a well set up deck can stay in tune for many years. This is even when it has been transported long distances so long as care is taken when packing it, which we are happy to advise on. In fact, we find that most under-performing decks are simply not correctly set up when they arrive, yet with some care, attention to detail and patience, virtually all these ailments can easily be corrected, thus allowing the deck to perform to its full potential. A standard LP12 service at Cymbiosis by Peter costs £75.00 + VAT per hour (up to a maximum of £270.00 but with a typical time of 2 hours) and includes a complete strip down of the deck to just the plinth and top plate, in order to ensure the fit of the top plate to the plinth is just as it should be, which is critical to sound quality, and then a careful rebuild. Included within the service costs are new replacement springs, bushes, nuts and washers. Once the deck is carefully rebuilt, it is then sound tested in one of our demonstration rooms before being repacked for transportation. LP12 services and upgrades can be carried out on a while-you-wait basis if you wish, provided you please book a mutually convenient time with us in advance. 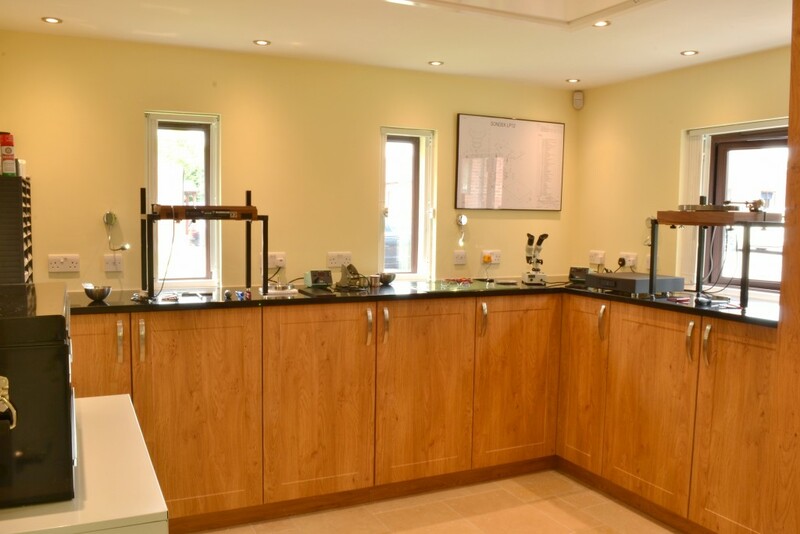 The photo on the right shows the purpose designed workshop where all the servicing and upgrades are carried out. Many customers leave their LP12s with us for set up but many others find it fascinating to understand the workings and complexities of a set up and Peter is happy for them to stay and watch their own deck being worked on. The choice is entirely up to you. You will find there is no black magic and there are no shortcuts, just years of experience and painstaking attention to detail. For more information about the set up or servicing of your LP12 please contact Peter directly using the contact information at the foot of this page. Alternatively, for information about upgrades for the LP12, please view the LP12 options section of this website.